My Vietnam Your Iraq premiered May 2011. Hear the stories of Vietnam veterans and their children who have served in Iraq. "I could never have imagined my father's struggles during my tour until I experienced it with my own son." These were the words a Vietnam War veteran told me during an interview. Another Vietnam War vet expressed "He should be burying me" after learning his son had been killed in Baghdad in 2004. The Vietnam War polarized the United States in the 1960s; decades later, U.S. involvement in Iraq initiated its own discord. But My Vietnam Your Iraq connects these two wars with less attention paid to divisive politics, choosing instead to focus on the personal stories of eight Vietnam veterans whose own children have served in Iraq. The stories examine the pride, fear, and myriad of emotions and challenges that parents and their children face during deployment, each with their own perspective and expectation. Though the stories are unique to the individual families, these intimate profiles resonate with all of us: the stories of the men and women who fought and fight for themselves, their families, and their country. My Vietnam Your Iraq focuses on the human side of the military and looks at the lineage within military families. The stories describe how common themes resonate as older servicemen and woman reflect on their own service and the thoughts they have about their children's service. Vietnam veteran participants may agree or disagree with current policy; yet they all support their child's decision to enlist. Some interviewees discuss the myriad of emotions they have gone through while separated from their family. While it would be unfair to say that these emotions are limited to parents who have served in the military, it is reasonable to assume that those who have similar military experiences may have a stronger bond or understanding of the military experience. Many stories about Vietnam veterans discuss important topics such as how they were treated when they returned home, the anti-war movement, post-traumatic stress disorder (PTSD) and homelessness. Accounts about today's soldiers are usually grounded in an argument about whether we should be fighting in the Middle East or how we show our support for the troops. The goal of My Vietnam Your Iraq is to stimulate discussion that may help us better understand the emotions and anxieties families are forced to deal with. Learn more about My Vietnam Your Iraq. Producer and Director Ron Osgood teaches Documentary Production courses at Indiana University and is a Vietnam War veteran. Filmaker Statement: I was in Chicago on Veteran's Day 2005 and attended the dedication of the new Chicago Vietnam Veteran's Memorial. There was a formal presentation, a military band and a flyover. 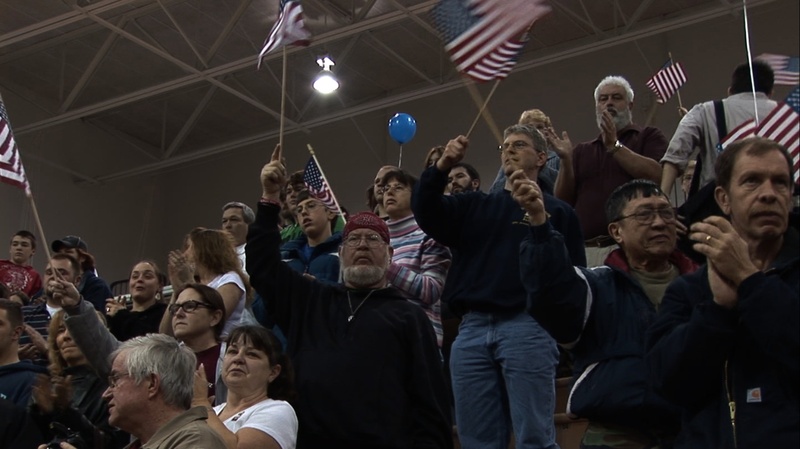 The audience was diverse in age, but it was easy to see that veterans made up the majority of attendees. Many of them were my age and were wearing something that identified their unit or branch of service. After the dedication, just several hundred yards away, I attended a rally sponsored by the Vietnam Veterans Against the War. During their forum, two young solider back from Iraq spoke out against the war. These two events convinced me to develop a documentary that connects these two wars. Within several hours I knew my story would be about Vietnam veterans whose own children served in Iraq. © 2015 Ron Osgood. All Rights Reserved. Text by Ron Osgood. Photos courtesy of Ron Osgood and Mark Mosrie.